2013 SR5 with about 61k miles. My wife and I just picked this beast up last week! First up for mods are smaller 17in wheels. Just ordered up some Helo HE901's in 17x9 and will wrap those with Cooper AT3 in a 285/70. Also ordered up a Prinsu 7/8 Rack. We love this thing already! Very smooth and we feel super safe. Especially coming from our daily which is a Honda Fit! Already has a receiver hitch to pull the teardrop. Awesome! I really like the early 5th gen 4Runners. 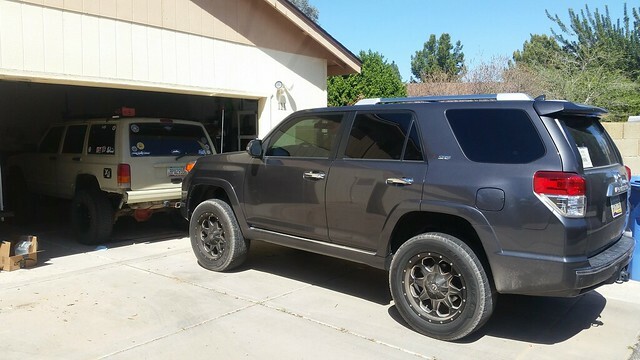 I wish I could have found an nice Trail edition 2010-2012 before I got the 2017 SR5 Premium. Last edited by lofreqjeff; 03-19-2018 at 07:17 PM. Congratulations on your new baby guys!!! Great looking rig! Nice looking 4runner. Are you planning to use her for off-roading adventures? Well actually since you asked, yes! My wife and I are quitting our jobs, selling our home, and going on the road for a year! We're going to pull our teardrop trailer with this and do the National Park thing and boondock our way around the nation! Very excited. We expect to leave around June. Very exciting, nerve racking, and just about every other ING's! The East Verde run will prob be one of the last runs for Sandy the XJ for a long while.